Commonsense Approach to Reduce Jail Populations: 3DaysCount is based on the premise that even three days in jail can leave many people less likely to appear in court and more likely to commit new crimes because of the stress incarceration places on jobs, housing and family connections, and that commonsense solutions can lead to better outcomes, enhanced public safety and more effective use of public resources. FRANKFORT, KY - (Thu 7 Jun 2018) - Today Kentucky became part of a cohort of states that are committed to commonsense pretrial reform and supported by the Pretrial Justice Institute's nationally recognized expertise and resources. Chief Justice of Kentucky John D. Minton Jr. and Cherise Fanno Burdeen, chief executive officer of the Pretrial Justice Institute, held a joint news conference at the Capitol in Frankfort to announce that Kentucky Pretrial Services, a department within the Administrative Office of the Courts, will take part in 3DaysCount. 3DaysCount is a national initiative to make pretrial justice safer, fairer and more effective by reducing the number of people in jail without sacrificing public safety. Pretrial is defined as the period from a person's first contact with law enforcement through the resolution of any resulting charges, usually through trial, plea or dismissal. "There's a growing call for reform against financial bail, which can penalize the poor," Chief Justice Minton said. "Kentucky Pretrial Services is joining the wave of pretrial justice reform, which is propelling changes to bail systems across the country. I appreciate the ongoing work of the court system's Pretrial Bail Practices Committee and of all of our judges who are working to improve alternatives for pretrial release. As part of 3DaysCount, Kentucky will have access to national best practices and the support of the Pretrial Justice Institute as we work to educate the judiciary, law enforcement and the public about the importance of pretrial reform." 3DaysCount is based on the premise that even three days in jail can leave many people less likely to appear in court and more likely to commit new crimes because of the stress incarceration places on jobs, housing and family connections, and that commonsense solutions can lead to better outcomes, enhanced public safety and more effective use of public resources. "PJI is delighted to welcome Kentucky to 3DaysCount," said CEO Burdeen. "Kentucky has long been a leader in pretrial innovation and our work together through 3DaysCount will help the state ensure that these improvements reach their full potential. By joining the 3DaysCount community, Kentucky is adding momentum to a national movement that is using commonsense improvements to make communities safer, enhance outcomes for people who come in contact with law enforcement, and use scarce public resources more effectively. We look forward to working with Chief Justice Minton and other leaders in Kentucky to realize these important goals." Kentucky's participation in 3DaysCount came about from the work of the court system's Pretrial Bail Practices Committee. In 2017, Chief Justice Minton asked a group of 14 circuit and district judges to create a new risk assessment tool and recommend ways to improve current pretrial practices and court rules in an effort to ensure a fair and just pretrial process for all defendants. During calendar year 2017 in Kentucky, more serious crimes (A, B and C felonies) only resulted in 10 percent of the arrest population. That translates to 90 percent of defendants charged with violations, misdemeanors and Class D felonies. Of the defendants arrested, 37 percent were held in custody until their court dates. 2018-06-07 - Frankfort, KY - Photo Leigh Anne Hiatt, KY Courts . 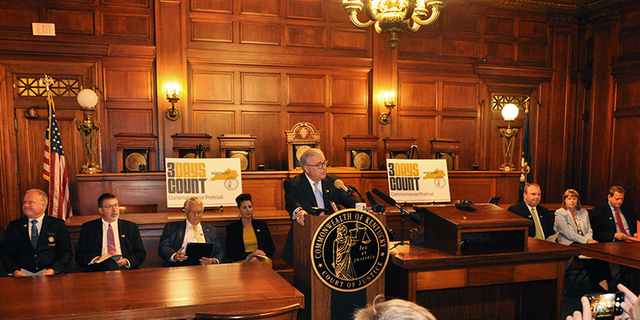 The speakers at the 3DaysCount news conference are, from left, Christian County Jailer Brad Boyd, Kentucky Public Advocate Damon Preston, U.S. Sen. Rand Paul's State Director Jim Milliman, Pretrial Justice Institute CEO Cherise Fanno Burdeen, Chief Justice of Kentucky John D. Minton Jr., State Rep. Jason Nemes, Chief Regional District Judge Karen A. Thomas of Campbell County and Jefferson County Commonwealth's Attorney Thomas B. Wine.